“I’m Japanese-American, and there are not a lot of things in Texas that are Japanese-American. Godzilla was a good thing for me. I loved it.” --Doctor William M. TsuTsui on his interest in Godzilla at a young age. 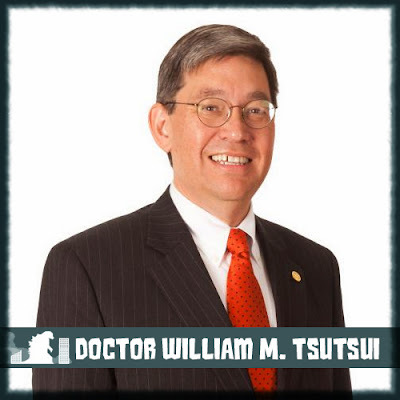 Godzilla fans know Doctor William M. Tsutsui a/k/a Bill Tsutsui as the author of Godzilla on My Mind. Winner of the 2005 William Rockhill Nelson Award for Non-Fiction. Godzilla on My Mind has also been praised for its scholarship, humor and extensive facts and Godzilla's impact on world culture. On November 1st Courtney Spradlin, of www.thecabin.net, reported on the Hendrix College selection of Dr. William M. Tsutsui as the next president. He is a specialist in modern Japanese business and economic history, and his published books examine topics ranging from banking policy to the film icon Godzilla. Tsutsui said Friday his Godzilla collection, which includes hundreds of Godzilla relics and toys, would be coming with him to the college. The collection was started about 15 years ago, he said, when a student who knew of his interest in the Japanese pop culture icon brought him a toy. “After that, all my students who went to Japan starting bringing me Godzilla toys,” he said. Tsutsui said his interest in Godzilla began when he was a child. If you really want to get academic about Godzilla check out Dr. Tsutsui's presentation at the UCLA International Institute Series below. Dr. Tsutsui argues postwar Japan is reflected through the evolution of Godzilla and presents the further impact of Godzilla's cultural impact on the world.